Last week, we reported that Kessil Lighting released the A150W LED Aquarium Light. In a follow up article, we added some more photos and details about the A150W. Well, now it’s time to see it in action. 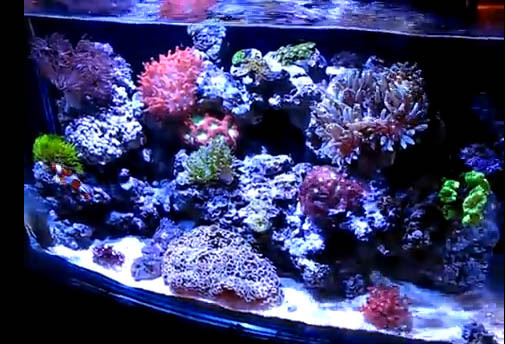 The team over at Atlantis Aquarium have added a couple of YouTube videos showing the A150W LED in action over a 22 gallon reef tank. The tank looks great with the one light over it. The entire tank (with the exception of the areas shaded by the rockwork seems to be covered with beautiful light ans the desirable shimmer. There is a Rose Bubble Tip Anemone that is absolutely glowing. The second video show a little more of the Kessil Goosneck mounting option. Overall, I think the color is great, and would like to know a little more about the PAR this light yields. I would like to know how long this single light has been over this tank?